I recently shot an IDPA state championship (under the auspices of the International Defensive Pistol Association, www.idpa.com) with over 140 other good people. One was a damn good sixgunner I had met only the week before at another match, where he almost beat me. His revolver is a fine one, a Smith & Wesson Model 686 specially built by the manufacturer’s Performance Center. At the state shoot, though, he came in dead last. Defective ammunition was the culprit. He’d had the same problem the week before, and if it hadn’t, I think he’d have beaten me. I’ve received a few interesting comments on it. I had mentioned in the article that running 3” Magnum shells in 2 ¾” shotgun chambers is not a cool idea. One fellow wrote in that they could indeed be fired there. Yes, they can, but there may be extraction problems, and they may cause cycling problems in repeating shotgun mechanisms designed for the shorter shells. There’s lots of you experienced folks out there. If you have experiences in this vein to share here in the comments section, it may help someone else from making a very serious mistake. I was once shooting an IDPA match, running factory reloads that I had purchased in bulk over the Internet. (Sorry, I don’t remember the brand. It wasn’t one of the big names.) I had shot one target and was on my way to the next when I noticed that people were shouting. I paused for a second and realized that they were shouting at me! I had been so absorbed in my shooting that I hadn’t noticed the squib load I had just fired, but thankfully the SO and many of the other competitors had noticed, and their warnings kept me from pulling the trigger that one more disastrous time. I still shudder to think what would have happened if I had needed to take three shots on the last target instead of two, and hadn’t had time to notice the warnings. The manufacturer ended up buying all the ammo back from me, including paying shipping, which, as far as I’m concerned, was the least they could do. I don’t buy from them anymore. I’m not sure what the real “lesson” here is. Buy quality ammo, I guess, but in this day and age, I can’t blame somebody for trying to save a few cents a round by buying from a small supplier. And I guess there’s no reason a small supplier can’t be just as good as a larger one. But for my peace of mind, I’ll gladly pay the few extra cents a round. Odd that I should come across this today. This past Saturday I was at a IDPAish match at a local club. One of my friends was using a S&W .45ACP revolver with moon clips. He had a a moon clip in his front pocket and there was a paster in it that had come off the backing. The paster had gotten stuck on the moon clip without his knowing. When he went to reload, it prevented the moon clip from inserting and cost him some time. 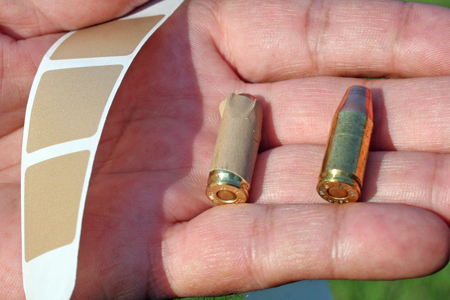 A 2-3/4″ barrel is bored to permit the shell case crimp to open fully when fired. A 3″ barrel is bored to permit the 3″ shell case crimp to open fully when fired. As indicated in the article, firing a 3″ shell in a barrel bored for 2-3/4″ shells may work , but as the 2-3/4″ barrel is not bored to allow the 3″ shell case crimp to open fully, significant pressure problems could be developed. Back when I was new to reloading, I tended to check my powder charges a lot more than I do now. I would load 5, check one, load 5, check one, etc. I would check by charging the case, then dumping the powder into the pan, weighing it, make sure everything was where I wanted it, recharge the case, then load the bullet. Except once, I forgot to recharge the case. At the range, I had a FTF. I cleared, still wouldn’t feed. So, I unloaded the 1911, took it to the bench, stripped it, and looked down the barrel, unable to see daylight. The primer had been enough to get the bullet to engage the rifling, where it stopped, stopping any other bullets from chambering. A good thing too, otherwise, I would have blown up the gun. Now, I check the setup before the run, making sure it’s throwing the right amount of powder. Once it’s set up, I run my loads. However, it comes back to “pay attention to what you’re doing”. One of the lessons I learned early from reading articles and books from writers such as Mr. Ayoob, is to always check your ammunition before loading into magazines, speed loaders or cylinders. I look for uniform appearance (compared to others in the sam box) length, make sure the primer is there and in the right direction (I find one every few hundred rounds that isn’t right) etc. I’m not sorting for match but to make sure the rounds look safe and functional. I do this with quality commercial ammunition and reloads. Although I’ve been shooting since I was pretty young, I can’t recall any bad ammo other than dud .22LRs. Lots of ammo related incidents, I remember first time I got a 3inch magnum instead of a 2 3/4 bird shot. The shells were mixed in a pouch and apparently a 3inch magnum got mixed in. First time my dad took me shooting 12gauge too! Seen a few people load the wrong caliber into a handgun. Usually it’s because they mix ammo or just aren’t paying attention. “Best” gun incident is when I told my fiance’s brother how great XDs were and showed him mine. He goes out and buys one, first magazine his slide-stop lever breaks. Springfield took great care of him and so far he’s the only one that’s happened to. Talk about unlucky. Really reinforces me always testing anything defensive first. Contrary to what some people I’ve talked to believe, 9mm will fire in a pistol chambered for .40S&W. I Wouldn’t recommend trying this. One day at a gun club, I found a piece of FIRED 40S&W brass that had been loaded with a 45 cal bullet. The case expanded off center but still left enough primer for the firing pin to set it off. Bad shooting and reloading practices. I still have the brass as an example of what not to do. And a 9mm will fit into a .40 Glock mag. Will it chamber and fire? I don’t know, luckily I stopped the person when I saw them grab the 9mm out of the box and knew they were shooting a Glock 22. I’ve also watched people load ammo BACKWARDS in the mag. I’ll wait while you try that in your Glock mag. Yep, that will cause a stoppage. Wheen I first got into Reloading, I learned all the mistakes firsthand – by making them. I had a (foolproof) Lee Loader with the proper measuring dipper for a .38 Special target load. The Handbook described a 3 grain load (Bullseye, i believe), so I very carefully loaded 3 dipperfulls into the cases and made up 6 rounds to start. Luckily, I fired the first (and only) round in a S&W model 28. The muzzle blast and recoil were amazing. I still have the pistol, which still shoots well, and was at least bright enough to go to the local Gun store and get laughed at while the owner explained how dumb I had been. Squibs seem to be a common problem with some handloaders at our club. It seems every steel action or IDPA shoot someone has a squib round. Usually they’re caught before the next round goes off. The one time there wasn’t would have made an excellent commercial for Glock barrels. The fellow shoots a .40 cal… not sure which model number. The squib plugged the barrel, the second round did the expected- but the barrel held together. Kind of filled the slide, though, conformed right to it for 3/4 the barrel length. Never bet your life on hand loaded ammo. It may not preform as expected and it is a huge liability in court. Went to the range with my XD (9mm) and S&W 1006 (10mm). Stupidly set both guns AND BOTH BOXES OF AMMO on the bench. Loaded and shot some 9mm and then loaded the 10mm. While loading the 10mm magazine a couldn’t help but notice the shapely female shooter a few slots down. Didn’t realize that the last round I grabbed was a 9mm NOT a 10mm (looking at the girl, not the ammo). Inserted the mag, closed the slide and aimed and pulled the trigger. CLICK. Hmmm. Opened the slide, glanced at the chamber and saw nothing so figured the slide had slipped over the top round. So, closed the slide again and NOT KNOWING THAT THERE WAS A LOADED 9MM ROUND DOWN IN THE BARREL, pulled the trigger. Amazingly, the gun fired and recoil was not too much different than normal but still noticeably not the same. Here’s where I FINALLY paid attention to “something is not quite right.” I pulled the target back and at 9 O’clock, just outside the black, was the perfect outline of a 9mm cartridge going throught the paper sideways! I looked at the box of 9mm ammo and saw a row of 4 instead of an even 5 and then realized what I had done. That S&W handled God-knows-what pressure to push that whole 9mm round out the barrel and, incredibly, the 9mm never went off! I’ll NEVER put more than one gun and one box of ammo one the bench at a time again and also stop and evaluate the FIRST time something doesn’t seem quite right. It was a pleasure to meet you last weekend. I had a similar malfunction not all that long ago. I was shooting my late 1960’s vintage BHP. It didn’t feed a round which for that pistol is very rare. Looking into the action I could see a ball of paper the size of a green pea. It was a small gum wrapper I had dropped in my trouser pocket rather than litter the pristine pistol bay. It had found its way into the magazine between the top two rounds. Since then I stow the initial magazine in a pocket with nothing else, including but not limited to gum wrappers, pocket lint, and grit. Last year I had invited my 85 year old uncle to the range. He started out shooting a Mauser HSC in .380. These hanguns used to be seen in every gun store but now are rare. Afterwards he statrted shooting a Sig in 9mm. He would shoot 1 rnd and have to clear the jam, then another rnd, a few choice words and another jam. I thought he was limp wristing the piece, so I asked to try it. I had the same problem. Then I looked down at his box of ammo and asked if this was what he was shooting. He said well, sure. It was still the .380 ammo. Luckily the bullets are interchaneable, the extracter was still holding the cartridge against the breach face so the round would fire. No damage. I was saddened because this man was a WWII army vet in the Pacific and had seen action on the islands; he was also the first person to ever put a gun in my hands. Back in the 70s I was a National Park Ranger and was shooting a NRA1500 in a match. My Chief Ranger had given me a case of S&W 148grn WCs. One the first stage, I loaded six and had my Speed Strips ready in their holders. The whistle blew and I drew my revolver and click, click, click, click, click, click. I reloaded and heard the same six clicks. The entire case of factory S&W Ammo was a dud. Needless to say, I had to wait till my next match to shoot a course with my own handloads. Never again did I trust any ammo to fire, I aways took some out and tried it before the match. It was a good lesson for me, especially with my duty ammo. Have to admit I’ve loaded a squib or two in the fifteen years I’ve been reloading, so I’m not perfect. As far as “wrong” ammo goes, I’ve several times made conscious decisions NOT to buy a particular gun because its’ ammo might be incompatible with some other gun I shoot. Case in point – I have a cherry .38 Colt Officers Model that would not be happy with +P loads, so I do not own any other .38 Spl. that would be safe with +P. There is no +P ammo in my stock at all, and never will be. For hotter performance, my .357 comes out of the safe. Ditto 8mm. Have a lovely preWW1 German stalking rifle that needs .319 bullets, so there are no other 8mm anythings in my safe. Several years ago at a sighting clinic that I was helping out at a fellow inadvertantly fired a 32 specialroun in a 30-30,it kicked like hell he said and of course jammed the action.Luckily that was all.We figured he was lucky that it did not blow up in his face. Well, a co-worker and I went to the indoor range. He had his Beretta 92 (9mm) and I had my Glock 22 (40S&W). We both shot a few rounds and set our guns down. He asked if he could shoot my Glock, having never fired one before. I handed him my empty, locked open Glock and, seperately, a loaded mag. He set the mag down and looked over the Glock. He then grabbed the mag, inserted it, dropped the slide and torched off a round. Only it went “Pfffoop”. I stopped him immediately. We found that he had inadvertantly created a new, albeit ineffective, round we named the “9X40 JP”. My friend “JP” had grabbed a Beretta mag and stuck it in the Glock. We found the empty case which was swollen and split. Appearantly the extractor had held the case well enough for the striker to lite it off. We still give a hard time about this one! The first revolver I ever bought was a .357 gp100. When I took it out the first time, my friend was trying a glock at the same station while I was loading. I, the professed expert, calmly grabbed the first round from the box on the bench, and couldn’t figure out why the .38 special wouldn’t go into the chamber…and then figured out that I was trying to push a 9mm into the silindar. Later, never having fired more than 50 rounds at a time, I put about 100 38 specials down range and tried to switch over to magnum loads…I couldn’t figure out why the cartridge wouldn’t go in…seems blast rings had built up from the shorter special loads and I had to clean the entire thing before I could fire the bigger magnum loads. Since then, it’s one gun perstation and I use .38 in .38 revolvers and magnum loads in magnum arms. I always feel like an idiot asking for help from the range guys, but better that than an accident. when I first started reloading I used a three die set and didn’t have any issues with any gun I reloaded for.